Arban UK is now a registered charity and our Health Care project has received approval from the Bangladesh Government, so with funds now in place, Arban in Dhaka have been able to start work. Activities are currently focused on preparing for the real implementation of the project, which we plan to start in early January 2012. The preparation activites are under the management of Mohammed Shah NEwaz, the project manager for Arban Bangladesh. He reports..
Merry Christmas and greeting from ARBAN Bangladesh! You would be happy to know that six days ago the Health Center Management Committee (HCMC) of Jheelpar slum managed a place to establish the health care center. The place is 180 square feet (18’ X 10’) and located in the middle point of the slum. According to the recent decision of the HCMC, we have started the construction works of the health care center on 21 December’11 (photo attached). The HCMC is supervising the construction works and participating in materials procurement. We hope, within the next 15 days we will be able to open the health care center. At present, our Physician is providing health care services using a temporary place in the slum with the assistance of our Health Promotion Officer. From 1 December to 21 December’11, we have provided health checkup services to the 282 patients (children 71). Among these patients, 198 received necessary medicines as per the physician’s prescription. These patients mostly suffering from diarrhea, dysentery, fever, skin disease, cough, asthma, vomiting, weakness, pains etc. 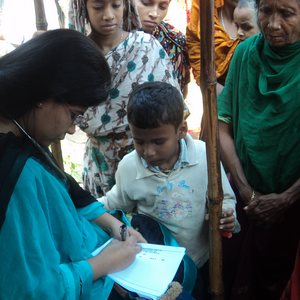 few pregnant women also visited our physician for checkup. We have also referred six persons to the government eye hospital those were suffering from eye diseases. In addition to that, we are providing eggs to one malnourished child of the slum. The people of Jheelpar slum are very happy to get these free services at their doorstep. A group of students (interns) from the Sociology Department of the University of Dhaka is visiting our health care services at Jheelpar slum. We have briefed them about our project objectives and activities. They have a plan to work on our project through case studies & households interview in this month. I think their work will help us in designing our baseline survey issues & methodology.